Kirsten and Cesar were married back in December just a few days before Christmas. After a mostly long distance relationship (Kirsten lived in the US, and Cesar in Brazil), it was wonderful celebrating the two of them finally being together! Although I'm sure they were the most happy of all. :) We started out with their ceremony at Sycamore United Methodist Church, and ended with their reception at Blumen Gardens in Sycamore. Because Kirsten and Cesar were both living in other parts of the country/world, I only met them once before their wedding. They were very sweet during our consultation, but it wasn't until their wedding that I learned what truly wonderful and caring people they are. Their love for each other and their family and friends is a beautiful thing. I feel very blessed to be a part of their day. All that to say, LOOK AT HOW STINKIN CUTE THEY ARE!!!! I couldn't believe how beautiful Blumen Garden's was during the winter!! And let me tell you, it was coooooooold. Kirsten and Cesar, you guys are my heroes!!! 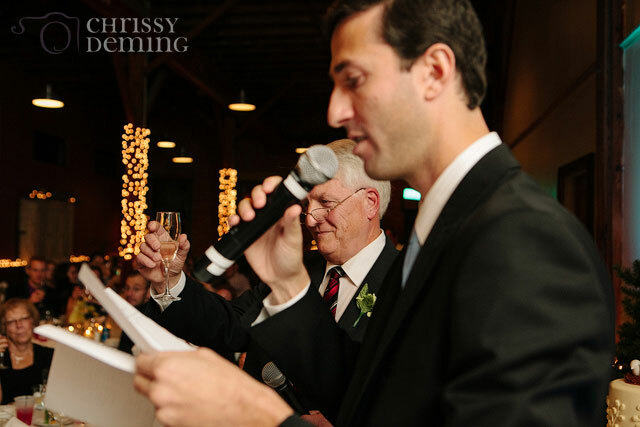 There was a fair mix of American and Brazilian guests, so Kirsten's dad read his speech in English and Cesar's best man translated it into Portuguese. Congrats again, you guys!!! Hope you guys are loving Brazil together!!! Note from Kirsten: I used Etsy.com to purchase quite a few wedding items here and there--a great website! Both: The entire ceremony--it was so beautiful and so special to have our friends and family all together to join us in our marriage. If you could, is there anything you would have done differently? Both: Don't sweat the small stuff on the actual day--if everything doesn't go as rehearsed, it doesn't really matter! Where did/will you go on your honeymoon? We went to Thailand, Cambodia, and Vietnam. Kirsten: What a wonderful day, even though it passed so quickly--I never imagined how much I would appreciate the photos afterwards, because you get to relive the day and see moments that you didn't get to see on the wedding day...and that is very special! Cesar: It was great to see our families and friends united for the first time and enjoying the wedding and celebration!